There has been an increase in the rate of economic growth in India in the last two decades. But the types of jobs and opportunities arising from this growth has not benefited all sections of the society equally. There exists stark differences in the benefits of growth across socio-economic classes and regions. Note: URP: Uniform Reference Period of 30 days. 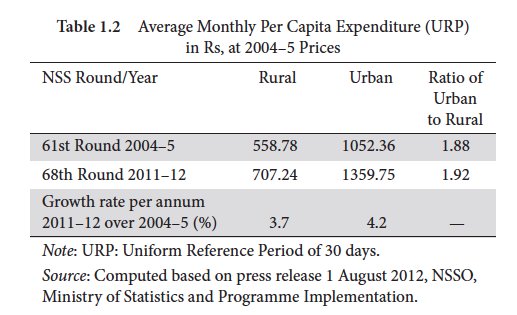 Source: Computed based on press release 1 August 2012, NSSO, Ministry of Statistics and Programme Implementation. India has achieved much in the last two decades of the reform period. Th e country is now a $1.8 trillion economy, the fourth largest in the world. However, a lot remains to be done for achieving all the economic, social, and environmental goals of the nation. In the post-reform period, India has done well in some indicators such as economic growth, exports, balance of payments, resilience to external shocks, service sector growth, signifi cant accumulation of foreign exchange, information technology (IT) and the stock market, and improvements in telecommunications. What are the recent trends in Gross Domestic Product (GDP) growth? The trend rate of GDP growth in the last 20-year period has been more than 6 per cent per annum. The growth rate was nearly 9 per cent per annum during 2003–4 to 2007–8 and 9.3 per cent per annum during 2005–8. All the three sectors (agriculture, industry, andservices) contributed to growth. The acceleration in growth was more due to the performance of manufacturing and agriculture during this period. For example, the manufacturing sector showed a growth rate of 14.3 per cent and 10.3 per cent respectively in 2006–7 and 2007–8 (Table 1.1). For about five years, starting from 2003–4, one observes a structural break regarding investments in the country. Savings and investments increased significantly in the period 2004–5 to 2007–8. During the 1990s, savings and investments hovered in the range of 21–24 per cent of GDP. The domestic savings rate rose from 23.7 per cent in 2000–1, to 32.2 per cent in 2004–5, and to 36.4 per cent in 2007–8. Similarly, the investment rate increased from 24.3 to 32.7 per cent and to 37.7 per cent during the same period. The pre-global financial crisis period was characterized by high GDP growth of more than 9 per cent per annum, low inflation, low fiscal deficit, and higher trade and capital flows. In other words, all the macroeconomic fundamentals were in good shape and the economy was buoyant. The global fi nancial crisis that originated in the US in 2008 transmitted to other countries. India is more globally integrated now as compared to 1991 when reforms started. Due to a slowdown in external and domestic demand, GDP growth in India declined from 9.3 per cent in 2007–8 to 6.7 per cent in 2008–9. To address the negative fallout of the global slowdown on the Indian economy, the government responded by adopting policy measures such as fiscal stimulus and an easy monetary policy. It may be noted that India’s counter-cyclical fi scal stimulus began much before the dramatic deterioration of the global fi nancial markets. In fact, it started in February 2008, six months before the start of the crisis. Dev, S. M., Mishra, S., & Veeramani, C. (2013).